Mid 20th century America was so different from today’s America, it is hard to believe that we live in the same country. If you are 50 or older, you know what I mean. If you are younger, you have no idea what I am talking about. And, believe me, despite the medical and technical breakthroughs, despite the passage of no-fault divorce and the “freedom to choose”, despite the new world of equality between the sexes, despite what so many of you believe to be the construction of a “better world” – you are the poorer for not having experienced the blessing of what it was like to live in America in the 1950s. Make fun of Ozzie and Harriet all you want. Deride the Cleaver family to your heart’s content. Lecture me about the hypocrisy of the 1950s church til you’re blue in the face. I’ll take my growing up years over yours any day of the week. Hands down. We were safe in our homes. We rode the bus to school without fear. We sat in our classrooms without armed guards. We respected our elders. We loved our country. And we knew that God watched over us – our parents, our teachers, and our political officials told us so. 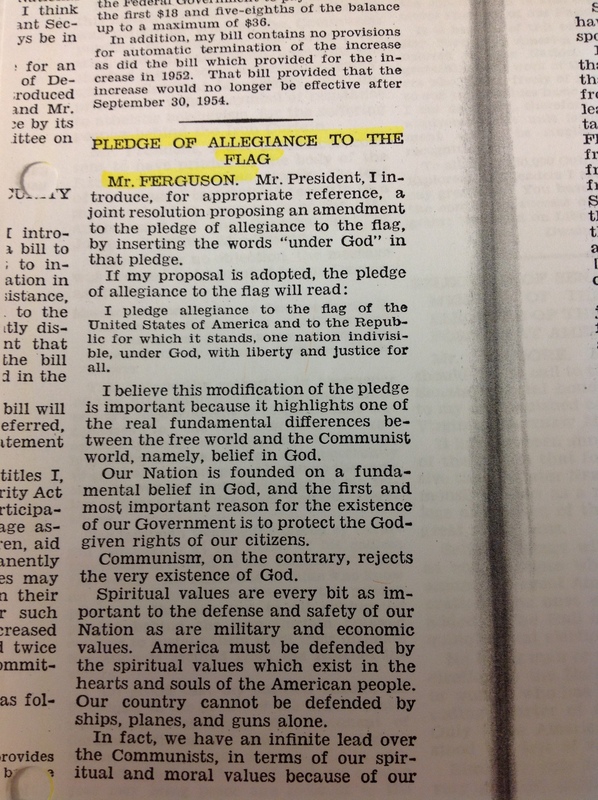 Two days later, Senator Homer Ferguson, in partnership with his colleague, Congressman Louis Rabaut, introduced a joint resolution to add “under God” to the Pledge of Allegiance. “Spiritual values are every bit as important to the defense and safety of our Nation as are military and economic values. America must be defended by the spiritual values which exist in the hearts and souls of the American people. Our country cannot be defended by ships, planes, and guns alone,” remarked Ferguson. The pages of the 1954 Congressional Record are filled with similar-themed speeches regarding America, America’s Christian heritage, and the critical role Christian values played in the protection of America from the “dark forces of death and tyranny”. If you know your history, you know that this class of Congressmen had Soviet Russia first and foremost on their minds. The terror of nuclear weapons in the hands of God-hating communists was palpable at that time in history. But, the respect for Christian values voiced in the 1954 prayer and speeches also paved the way for the civil rights battle that was brewing on the horizon, a battle that was largely won based on Christian values articulated and practiced by a Christian leader. God is still watching over America, but I cannot help but wonder what He is thinking about this great nation that once institutionally revered His name, respected His ways, spoke openly about His blessings, and warned regularly about His wrath. This entry was posted on February 8, 2013 at 3:41 pm and is filed under Uncategorized. You can follow any responses to this entry through the RSS 2.0 feed. You can leave a response, or trackback from your own site.